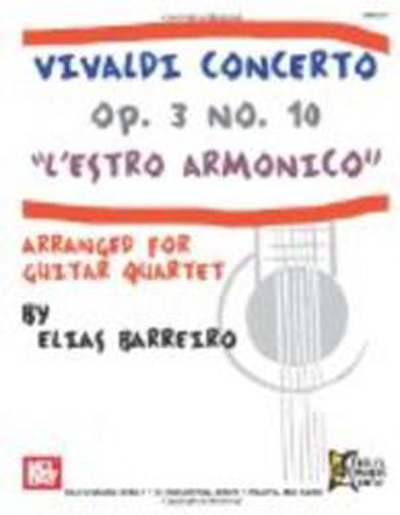 The tenth concerto in B minor in L'Estro Armonico (best translated as The Harmonious Inspiration), which is edited here in A minor - for four solo guitars - is one of the most famous in the entire collection -- indeed, in Vivaldi's entire output. Scored for four solo violins, two solo violas, solo violoncello, and an strings orchestra. Johann Sebastian Bach not only admired Vivaldi's Opus 3; he copied it openly. In a general sense the Vivaldi pieces gave impetus to much that is in the German master's Brandenburg Concertos. More particulary, six concertos of Vivaldi's Opus 3 were copied by Bach as the basis for six of his concertos: two for 0rgan (BWV 593 and 596 based on Opus 3 nos. 8 and 11 respectively), three for solo harpsichord ) BWV 978, 972, and 976 based on Opus 3 nos. 3, 9, and 12 respectively), and one for four harpsichords and orchestra, in A minor (BWV 1065 based on Opus 3 no. 10). Bach frequently rewrote concertos scored for one kind of instrument, substituting another. It is evident that Bach thought not so much in terms of the violinistic nature of the originals but in their harmonic and rhythmic potential which could be realized on any instrument. Since Bach has already justified an arrangement of Opus 3 number 10 by the great aesthetic success of his four-harpsichord version, it serves to reason that an arrangement for four guitars is equally valid. Just as Bach preserved everything of the original Vivaldi and added only a few doubling to accomodate the left hands of the harpsichordists, so in this version the substitution of guitars is done with little or no change of original-notes. The arpeggios especially prominent in the second movement lend themselves ideally to guitar playing, and the ability of the guitar to play both lyrical lines as well as passage work suits the violinistic lines and passages of the original.